Posted April 5th, 2013 by a_russell & filed under Uncategorized. Right now, Bodacious Cases is set-up in Texas at a huge trade show that only happens twice a year. People come from all over the country and world to see this show. So far, we’ve had hot chocolate for the first time in Texas (which we never expected to happen) and enjoyed all the rain, rain and more rain! Another amazing thing was having the honor of meeting Company Commander Jason James. We saw him walk by our booth, he didn’t stop then, but we saw the flag on the back of his back pack. I then said “Hey sir, are you in the military?” He replied, “Yes ma’am.” Then my mother Cheri said “Do you have an iPhone?” He answered, “Yes ma’am!” But, he had a competitors case. I then attempted to give him a Bodacious Case as a thank you for serving our country. I also told him about how if we sell 12 cases, we give one to a Veteran. He kindly rejected my offer and refused to accept a free case. “I would much rather pay for the case to help out a Made in America company so that you can give a case to another deserving Veteran. There are other veterans out there who deserve this case much more than I do,” he said. I thought that was amazing and talking with him nearly brought my mother and I to tears. Most people love free things, but he was so honored and polite to help a company that was trying to give him a case for honoring our country. He gave us some ideas that will make their way into Bodacious Cases. He also told us that a lot of people help the Wounded Warriors and The Fisher House. It’s a place that helps the families of those who have served and are in the hospital. Mr. James told us that if he didn’t have his family by his side when he was going through a lot that he wouldn’t have made it. It’s so true, when you’ve gone through what those who serve us do; you need your family by your side to get you through it. After he started to walk away something told me to give him one of my Uncle’s books that he wrote called Escaping Death’s Sting. It is about his journey and his life. He was very happy to accept it and was going to share it with all his fellow comrades once. 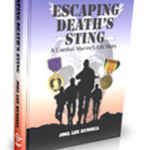 You can check this book out at www.escapingdeathssting.com. 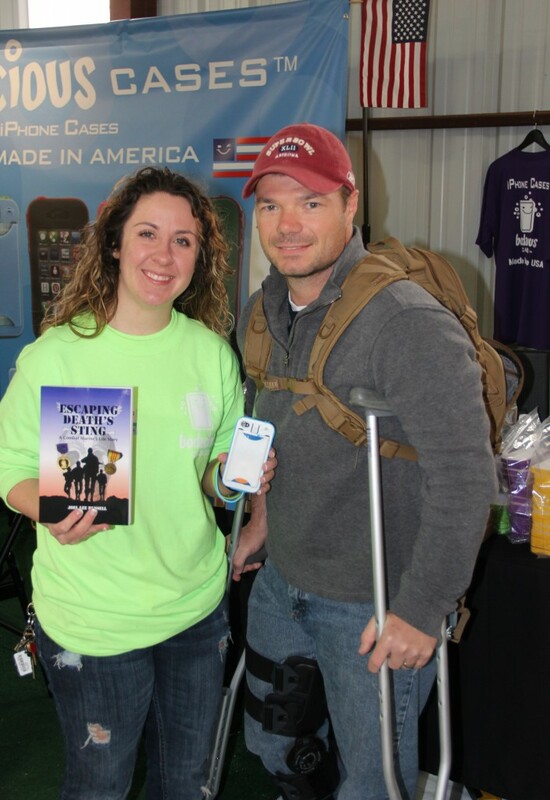 Because of wonderful honorable men like Company Commander Jason James, Bodacious Cases honors all of our veterans.